Twin Spirits Of American Dreams! International Day 2019, AUC 100th Bicentennial! 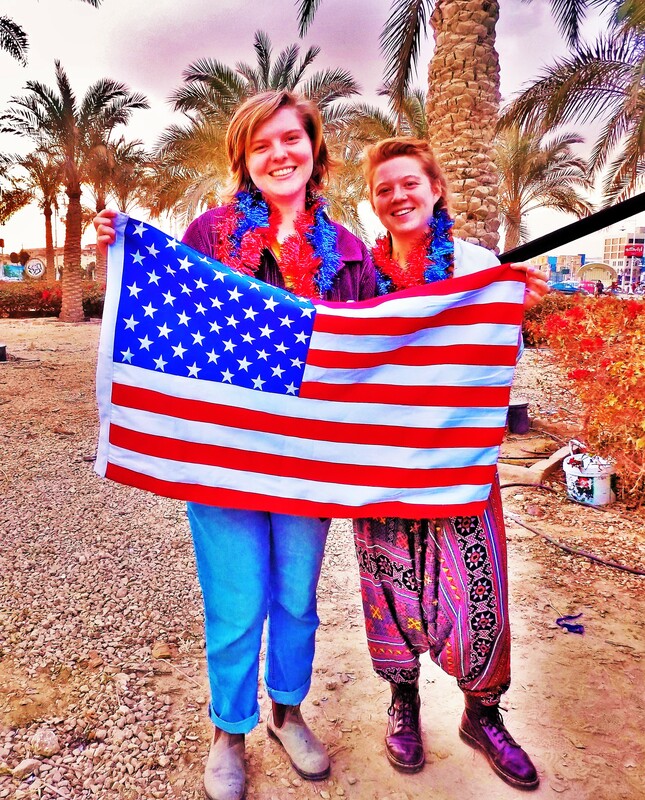 How the Presence of Spiritual Twins, Reflected the Balance and Harmony of America's Image at the American University In Cairo's International Day 2019, 100th Bicentennial! Things often come at just the right time. You may have to wait a little bit. Yet, the right people come at the perfect time. The Universe always ordains it as so. So, on March 4, 2019, at the American University in Cairo (New Cairo campus), a painting of humanity’s vigilance, took place, again. With its carnival festivities, guests, visitors, and the AUC community came to observe the celebration of the world, and a century of AUC’s existence. All for another piece, of course. Yet, on that day, the beauties of America’s authentic feminine energy was illuminated, evermore. Two, enchanting friendship twins came at the right moment, and at the right time. Preparing the booth is one thing. Two days prior, was met with the usual hustle and bustle of running around. Searching for decorations and collecting anything that would be of use for the booth. Borrowing another white-colored cloth, for the decorative occassion, came natural. Healthy alliances had already been made. Then, of course U.S. Embassy information pamphlets and scheduled events at the American Corner of the Maadi Public Library, were sure to gain interests and cause the rise of questions. Oreo cookies returned from the previous year. Things were in order, and all that was left, was the final dress up. Even when simply monitoring the booth, one must reflect upon the national fashion of one’s country. Presentation + the country Spirit. . .is key! Grabbing oreo cookies, getting changed, and returning to the area, where the carnivalesque event would take place, was a journey, in itself. Not to mention a surprise security check of showing that I had received an invitation. Funny enough, I was just inside. Others had saw me in. Nevertheless, returning to the booth, the coloration would begin. There is something exciting about making things beautiful. In making things in harmony with the Universal galaxies. Wink! For another telling. Blowing up balloons, with the help of my dynamic feminine and masculine Ugandan neighbors was. . .LOVE. Laying the pearl-colored palette, as the foundation, would bring shape to the other decorative pieces. Wrapping blue and red traces of sparkling decoratives around poles of the booth, illuminated life in the red and blue coloring of America’s flag. Mini-souvenir, plastic plates, decorated in the USA flag, served as tiny props on the table. Taste of oreo cookies, would be the mini-taste of America. . .for that time. Dressed, pressed, and ready to go. All that was missing was the flag. Who would carry the flag? Who would symbolize an authentic representation of American culture, and the foundation for which she was built upon? Her Indigenous presence of Native daughters and sons. Black American gardens of magical tales. Mexican-American culture, and it’s nourishment of Tex-Mex tales. Jewish, Italian, Irish, Scottish, German, Dutch, Swedish, Greek, Polish, and others who left from Europe’s front door. Their cultural descendancy mersing into a new American identity, with the 50 states. Other groups would come, trying to find their way, through. Yet, who would carry the flag? Who would march across the stage, with praises of red, white, and blue? Does solely having the passport, count as. . .true? Or is more required, in natural cultures, of that red, white, and blue? Too many want to hold it as a status symbol, and then they’re, through. Yet, who can really claim the identity of that red, white, and blue? Sometimes, you just have to sit and wait. Getting caught up with our own thoughts can put a strain on our mental awareness. It was best to sit and wait. So, wait, I did. Finalizing decorations, and the booth presentation, my Spirit became enamored with the personification of 2. Their Spirit, personality, and physique, was definitely part of that Twin nature. It was amazing how they were in search of their country’s booth. Their presence was the final touch to America’s participation in the carnival. Escorting them to the parade line, they naturall fell in line, with the flag of USA. A natural painting to match the scenary. Yet, there was one final touch. If you are going to attend a carnival, you must have some colorful appeal. Running back to the booth, I knew the perfect accessories-blue and red sparkling glitters of appeal. Wrapped around their necks, they were ready to go. Now, they were picture-perfect for the carnival festivities. Walking across that stage, our nation sung it’s song. Looking on, with my camera in hand, I looked on as a proud, Black American woman. For the naturalness of America, was again showcased at another International Day at the American University In Cairo’s New Cairo campus. What a pleasure for it to happen at the 100th Biccentenial! Their image was iconic, and in these times, I must say. The natural bubbleness and colorful vivacity of these two twins, was in line with the Spirit of the night. Furthermore, I remember the aura of peace and balance that their presence brought to the American booth. After the presentation of nations (and the myriad nations were colorful, indeed), the American, Spiritual twins frolicked around the different booths; gaining a taste of all countries and culinaries, presented on that day. Just this action alone, was a great performance of American cultural ambassadorship. Lastly, they were a representation of healthy images of America’s spiritual essence and beauty. The Americans That Could. . .and Egypt’s Returning Daughter: The Power of Preseverance, Courage, and the Audacity to Be Vigilant!